Rahm Emanuel is out of the race for mayor of Chicago. This is not necessarily a good thing for African Americans in the city. All of the black people thinking they are equipped to run City Hall is like walking down Division Street in Austin seeing five storefront churches on one block. Knees still sore from praying in half-empty pews and major Christian, Sunday concert productions in arenas aren’t helping the cause either. The alderman/women of these wards are not apt to handle the poverty and blight. Some of them have been in office since I was a teenager. From the time when the Daley administration held power, many of them have been voting in favor of damaging already vulnerable people. Austin residents watch as gentrification increases the number of Puerto Ricans and Mexicans moving in from surrounding wards. Many homeowners have not recovered from the housing bust of 2008, still waiting on relief like hurricane victims in Puerto Rico. It has been my observation that there is not a unifying black vote in favor of something – but an overwhelming stance against the greater offense. We remain unified in the problems of inadequate education, food deserts, affordable housing deficiencies, inmate recidivism, lack of mental health facilities and too few jobs with livable wages. People were in uproar over the Laquan McDonald video. The ripple effect carries on during the present trial. Emanuel closed nearly 50 schools at one point, including four in Austin. Pension issues and city hall budget hearings filled news cycles. Crime and gun violence become synonymous with Garret’s Popcorn and deep dish pizza. We are still trying to convince other races that black lives matter. The whispers in barbershops, beauty shops, churches, bus stops and local taverns are getting louder. 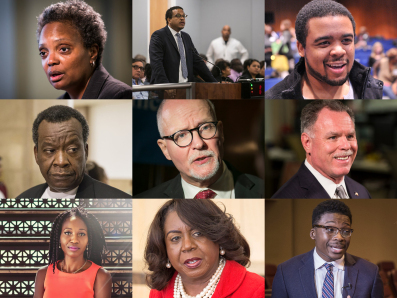 The list of black candidates running for mayor, according to a recent Chicago Sun-Times story, includes: Dorothy Brown, Amara Enyia, Ja’mal Green, Troy LaRaviere, Lori Lightfoot, Neal Sales-Griffin, Toni Preckwinkle, William ‘Dock” Walls and Willie Wilson. The black vote is divided and is likely to remain the course so much so that a non-black candidate could win the race. Many people still disagree about what the black agenda should be as many of the experiences of African Americans vary. We still fight the same battles from the 1960s and chanting, “we shall overcome” has not worked. Feet are still marching on the same blocks where blood of youth has soaked into the cracks of the concrete. Our voices stop just shy of Washington Boulevard and LaSalle Street. The windows of board meetings hang high above the picket lines for healthcare and increase in pay. All the candidates will two step to the same rhetoric of blaming the predecessor for mistakes. They will gleefully point out the shortcomings of the other. The black audiences will take personal attacks as most blacks vote with an emotional string attached. Each candidate will be above reproach. There will not be a victor within this ring of candidates. The conversations will become blaming that will return to the chatter of church intermissions and buzz just above the sound of clippers on a Saturday morning.